I had never quite got the hype surrounding Lush Cosmetics until recently. Previously it had always been that shop on the high street that gave off an overwhelming scent as you walked past the door and sold 'weird' soaps that were displayed in large blocks around the store. Of course I was in the last to know group as I saw various Lush products popping up on blogs, instagram and tumblr so it was definitely time to get involved. 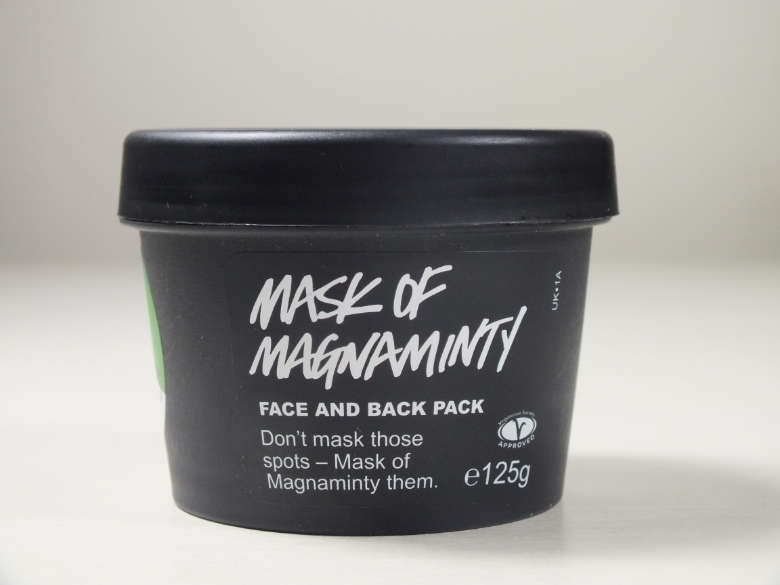 I've already spoke about the lip scrub and Comforter bar in previous posts and a Lush shampoo and conditioner duo featured in this weeks empties post you can read here but today's post is all about hail to the gods, the Mask of Magnaminty. I think I first heard about this from Jacyln Hill and then it cropped up on one or two blogs thereafter so I decided to give it a try as an alternative to the GlamGlow Mud Mask which despite a lacklustre start I was starting to lust for again. Lush describes the product as 'a multi-purpose mask with a mixture of gentle yet effective ingredients to clean, calm and clear the skin. Easily smoothed over the skin, this mask is made with peppermint oil to stimulate, marigold oil and chlorophyllin in to treat the skin; evening primrose seeds and aduki beans to gently exfoliate as you remove it'. So let's look at what they said and whether I accepted their claims. You'll remember my gripe with the GlamGlow Mud Mask was the difficult to apply so ease of application is definitely something I look for from my masks. I apply using a spatula I received in an exfoliator years ago and the thick consistency makes this easy to do yet not too thick that you can't spread and distribute over the face. In comparison to Origins Clear Improvement mask which I have some difficulty managing to evenly slather on my face this is far easier. I will tell you right now if you do not like the scent of peppermint you will not like this product because the smell is pretty overwhelming. This is something I like and enjoy and really does liven you up. Be careful if applying too near the eyes especially if they are sensitive because there has been one or two occasions when I've been a bit overzealous and did suffer from them watering. I'm having a good skin moment thanks to La Roche Posay's Effaclar Duo which you can read more about in this post but a once a week treatment with the Mask of Magnaminty just takes it up another level. Once removed my skin feels clean, refreshed and glows that I wouldn't have any problem with answering the door to the postman after it's use. I had plans to treat myself to a few masks from the GlamGlow range in the US when I visit next week but I think I'll save my money and buy a few more from Lush instead, I have my eyes on Cupcake and Oatifix. Please share your mask loves - but they need to me good to tempt me away from this precious pot! I love the smell of Lush products!! I know what you mean about mint around the eyes though!! I've done that before. 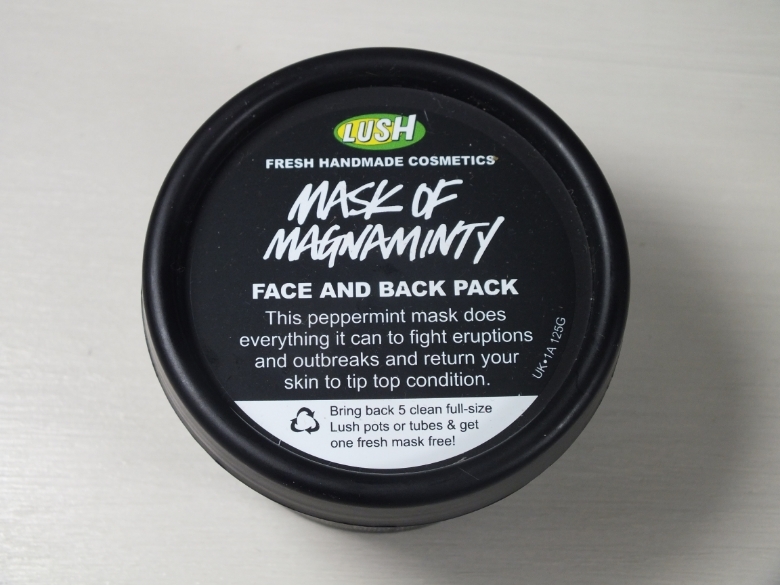 This seems to be the Lush mask that I've heard the most about - once I'm finished with a couple of my existing masks I want to try this one out :) I quite like anything pepperminty as I find it really stimulating yet soothing, so this sounds up my alley. Great review :) I love the smell of Lush stores, it always makes me want to go in and buy something. This mask sounds great, I love anything peppermint scented so I will definitely have to try this.